I think I'm going to ask HyVee to stock it. Couldn't hurt to ask! The fourth one's a root beer, I don't remember whose. $4/4 actually is a fine deal. Most sodas at America's Market, say, are $1.50-1.75, and a four-pack of Sprecher anything is rarely below $4. If you are out in the DeKalb/Sycamore area you can get Sprecher's at Farm and Fleet. You can get it at Jewel here in the city, too. The cheapest place I've seen for it, about the same price as at the brewery itself, is Woodman's in Kenosha. Sometimes as low as $2.50-3 for a 4pk there. Picked up a four-pack of Sprecher's Red Apple Soda at Woodman's. It's labeled "seasonal." It has a very pleasant sweet apple taste. I'm fond of the Mexican apple soda Sidral Mundet, and liked Sprecher's even better. For the Sprecher's fans - you can get the syrup for a number of their sodas at the brewery in Glendale, WI. They just request that you call first since it is a long hike to the back to get it. For the Moxie fans - Fresh Market often carries it in their cold soda section in Brookfield, WI. Hopefully in Fox Point as well when they open up next month. Do you just mix the syrup with setzer or is there some process to be followed? That'd basically be it. Ideally you'd have a soda fountain setup at home that works with bag-in-box syrup. You're looking for a 5:1 ratio of carbonated water to syrup. You could also get Dublin Dr. Pepper in bag-in-box form for a long time. Not sure if you still can, what with the upheaval down there. Back when I was still drinking soda regularly, my dream was to have a two-tap soda fountain in the house with Sprecher's and Dublin Dr. Pepper. zoid wrote: Do you just mix the syrup with setzer or is there some process to be followed? What we used to do is St. Louis and Cleveland was to get some cheap store brand club soda and refrigerate it. We used "old style' Coca-Cola glasses - the ones with the "syrup" lines. Syrup goes in first, then soda water, then stir and add ice. One more thing. You can use fruit juice concentrates also to make natural sodas. IMO, you need to test the proportions as tehy do vary. When America's Market closed, I bought a couple bottles of every Ginger Beer they had, plus a bunch of other things. I thought "Hot" meant a lot of ginger, like a ginger beer. But no, it appears to have a hot chile heat, lip-tinglingly so. Not what I'm looking for in a ginger flavor. This is pretty nasty. The Fox Point Fresh Market has opened up. I went in and cleared them out of Moxie this morning. It has been a while since I was there, but the Brookfield store seems to have more soda. Picked up some interesting pop at World Market recently. The four-pack of Bruce Cost Ginger Ale is all gone. Lovely stuff. It's not quite the wow of the house-made version at Big Bowl, but it's easily the best ginger ale I've tried. Nesbitt's Orange is a nice orange soda. A little less artificial tasting than many. Zuberfizz Key Lime Cream Soda is pretty pleasant, though not very key-limey. I'd like it to have more bite. It's rather like a softer version of Green River, and it's made with cane sugar. We were as picky when selecting our bottled Root Beer as we were with our craft beer we put in our Pub. If you find a bottle, Fitz Root Beer out of St. Louis was the hands down winner. They do about 8 flavors including a really nice cream soda. 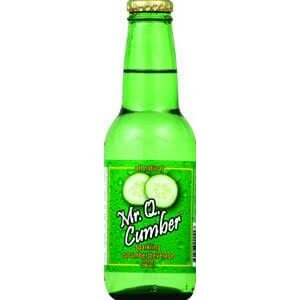 After tasting Mr. Q-Cumber, we went back to World Market to pick up a six-pack, even though it's $1.49 per 7-ounce bottle. I think it's going to be really wonderful with gin. I've been avoiding pop lately, both sugared and artificial, but I was walking around on a hot evening and felt like I deserved a treat. Local Indian grocer Apna-Desh in Prospect Heights has a few imported drinks, and this caught my eye. This rates as "oh hell no!" Like mixing tamarind chutney in a cola. Too sweet, and cumin just doesn't work. Could not take more than a couple sips before I tossed it. I am in Russia and enjoying the elusive Schweppes Bitter Lemon. I am trying to OD on it but to no avail. The stuff is perfect. I also tried the grapefruit flavor but just can not get enough of the Bitter Lemon. There is a Mojito flavor but I am skeptical of mint flavored drinks-too much like mouthwash. But I may take one for the team...... maybe I will mix it with vodka. Dr. Pepper Cherry: Not an improvement on the original. Very pretty in the glass, though. B. Recently, my Dad advised he likes Cherry Coke over regular Coca-Cola. I like Coke and Dr. Pepper quite a bit. 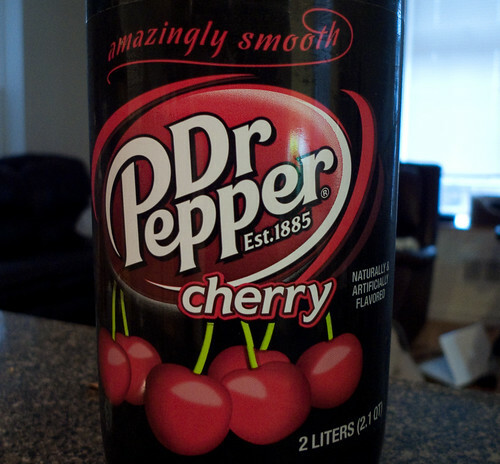 Impulsively, I bought Cherry Dr. Pepper recently thinking it may be the best of both worlds. If only I had seen gleam's assessment first. Cherry Dr. Pepper does not really taste of Dr. Pepper nor is it a Cola, it is a memorable failure. One not to be repeated until what I recently bought is consumed. Unfortunately, I consumed enough this evening to be still awake at 3:00 am. This stuff is biting me back. WBC spicy ginger ale is a tasty low cost ginger ale that is sold at Jewel. It is made in Chicago and is far better than the big market ginger ales. It really makes a nice gingery mixer for bottom shelf highballs. I also love Sprechters (which you can usually find on sale at Menards) but this is pretty close. It is sold in four pack bottles or a plastic bottle (perhaps quart ) for 3 for $5. Other flavors are vanilla and root beer. Interestingly, our Jewel runs out of the ginger ale more frequently than the other varieties so folks are catching on to it or I am drinking way too many highballs.